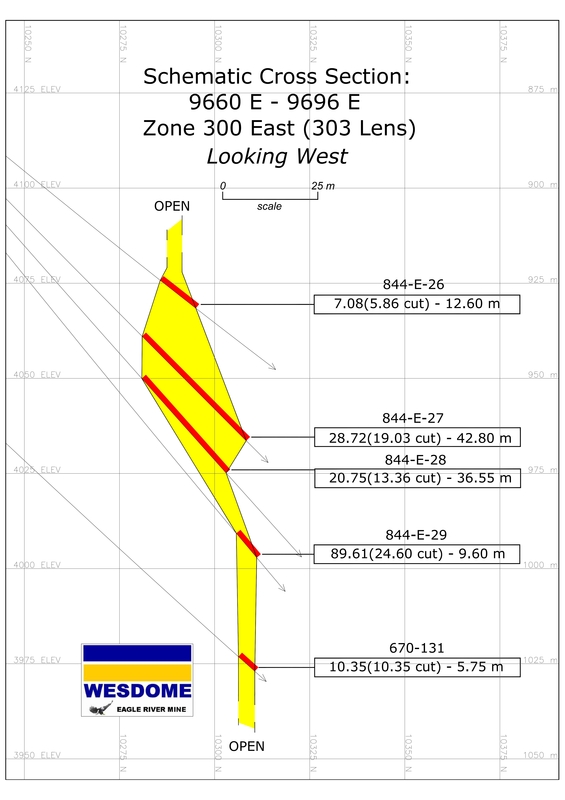 TORONTO, ON--(Marketwired - January 26, 2017) - Wesdome Gold Mines Ltd. (TSX: WDO) ("Wesdome" or the "Company") is pleased to announce recent underground drilling results from its 300E Zone (303 lens) at its wholly-owned Eagle River Mine, Wawa, Ontario. 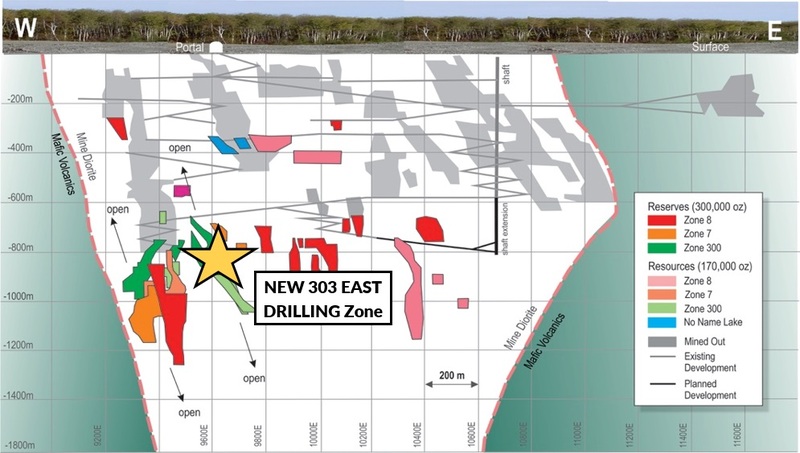 Development completed in 2016 has provided access to drill this discovery, initially announced in a Press Release dated November 30, 2015 (www.wesdome.com). Results are compiled in Table 1 and illustrated on the accompanying schematic cross section (Fig 1). Complete assay breakdowns of these holes are appended to assess grade distribution and internal continuity. Duncan Middlemiss, President and CEO, commented, "These results contain potential widths of up to 20 metres and are unprecedented at Eagle River. The current proximity of these intercepts to mine infrastructure coupled with the sheer volume of high grade mineralization will potentially have near to mid-term positive production implications. Furthermore, the presence of these structures give rise to the possibility of additional zones of similar size and grade, as well as bulk mining opportunities at Eagle River." To date, drilling has identified at least three steeply plunging pipe-like bodies between depths of 800 and 1,000 metres. Two of these have been partially delineated and remain open at depth and up plunge. We are in position to develop into these zones; confirm their dimensions, geometry and grades, and drill their extensions. The Eagle River Mine commenced commercial production January 1, 1996. To date it has produced 1.1 million ounces of gold from 3.8 million tonnes at an average recovered grade of 9.0 gAu/tonne. The bulk of production has come from a series of tabular, steeply-inclined quartz veins hosted by an elliptical quartz diorite stock. The mine is serviced by a shaft and ramp system with the deepest development to date attaining 970 metres.